I was barely five years old when JFK was assassinated. I must have been playing outside with my friends. When I came inside our house, I saw that the TV was on and my mother was crying. I asked her what happened and she told me but I didn’t understand. For her, and many millions like her, John Kennedy represented enthusiasm, hope for the future, confidence, an end to the arms race, a man on the moon; all the good things that America could be. Was it Kennedy himself who first characterised his presidency “Camelot” or was it his wife who saw her husband as the one who led the country to a glorious new age? Jackie Kennedy was just 34 back on that fateful November day but she was already well acquainted with heartbreak and tragedy. Two of her four children had died in their infancy, one being stillborn and the other just two days old. Nothing, though, could have prepared her for her husband’s sudden and tragic death, yet she somehow managed to stay poised and relatively sane in those minutes and days afterward. Perhaps she was in shock but she still had the wherewithal to understand that she alone was responsible for creating her husband’s historic legacy and ensuring that it not be forgotten. Jackie is grieving but she’s on a mission. She notes that, with the exception of Abraham Lincoln, no one remembers what the two other assassinated US presidents’ (James A. Garfield and William McKinley) legacies were. Jackie, poised and dignified as ever, was not going to let that happen to her beloved Jack. In conversation with the journalist, she tells how she planned the minutia of her husband’s state funeral, right down to the horse-drawn caisson that inched along Pennsylvania Avenue from the White House to the Capitol Rotunda where his body was laid in state until his burial at Arlington National Cemetery. Outside of this and a few subsequent interviews over the years, we know very little about Jackie, so protective she was of her privacy. We do see, though, how quickly she blossomed from being a meek and perhaps vacuous wife into a strong force in her own right. Soldiers are tested in battle and Jackie was a soldier par excellence. Both Jackie and Jack understood better than most the power that the then relatively new medium of television had in shaping public opinion. Jack used it to his advantage during his presidential debate with Richard Nixon. Jackie, though uneasy under the glare of the spotlight as can be seen in her televised tour of the White House, was a quick study. Before long, she was winning fans at home and abroad with her iconic fashion sense and warm smile. Princess Diana most likely modelled herself after Jackie and was successful at it. Others have tried since then but they are cheap imposters. JACKIE is as sad as the events are in the story. One can’t help but be both moved and in awe of the woman as she held herself, her family and, dare I say, the country together during those dark days. 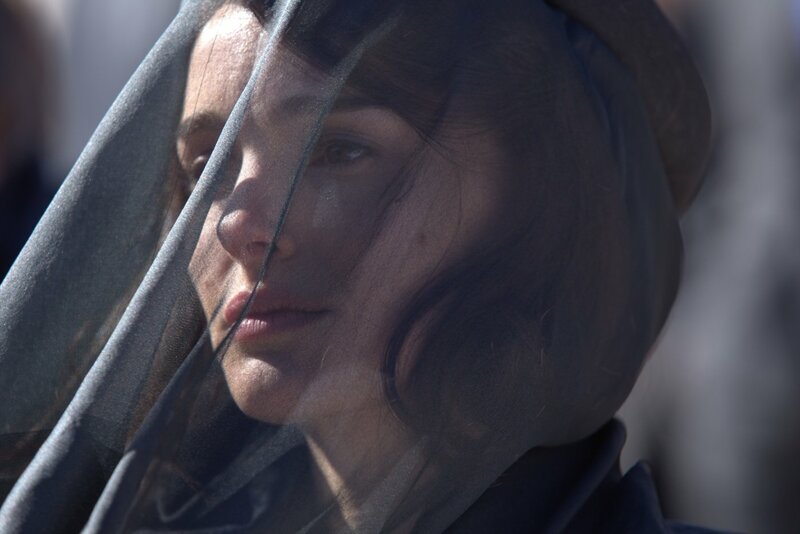 Portman does a superb job bringing her back to life, showing us her many sides — privileged rich girl, duty-bound First Lady, protective mother, resourceful image crafter and steely but bitter widow. (Portman has been nominated for an Oscar® but it’s doubtful she will be taking home her second statuette for this role. The competition is strong this year.) Mica Levi’s dreamy yet disquieting score adds to the film’s sombre mood. This is Levi’s first Oscar® nomination but she’s already won 21 other awards for either this or her previous work. My vote is with her for this one because this music is outstanding! Also doing good work here is Greta Gerwig (FRANCES HA; MISTRESS AMERICA; MAGGIE’S PLAN), who plays White House Social Secretary and long-time Kennedy friend, Nancy Tuckerman. After taking on so many New York City-based ditzy characters, it’s nice to see her in a serious role. JACKIE is a solid film throughout and well worth your time and money. Go see it and remember to bring along some tissues. You’ll need them! Sorry, no Facebook Live this time. I had sound problems trying out new audio equipment.